Darjeeling town, the Queen of the Hills, has been a favoured hill resort ever since the British established a sanatorium in these hills in 1835. Over the years Darjeeling has become India's favoured destination in the Himalayas for both domestic and foreign tourists and travellers for some of the most stunning views of the mighty Kanchenjunga, for a taste of the famous Darjeeling tea and for the indescribably exciting ride on the toy train! The great American author, Mark Twain, once wrote, “ The railway journey up the mountain ...takes eight hours to make it. It is so wild and interesting and exciting and enchanting that it ought to take a week. The trip on the DHR is the most enjoyable day I have spent on the earth!” Indeed, like all tourist destinations, Darjeeling is a friendly town with some of the most friendly people to be found anywhere in the world and with attractions and facilities to match. Hotel Springburn, established in 1973, is a small family-run heritage boutique hotel that offers homely luxury away from home in the mountains. Located in the heart of the town and yet far away from the madding crowds, Hotel Springburn - named after a pretty Scottish village - offers thirteen well appointed rooms with all the modern facilities and the friendliest service you could ask for! 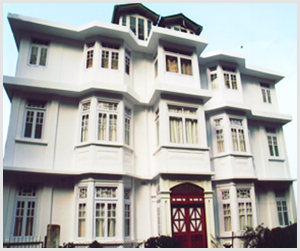 Darjeeling is a heritage town and Hotel Springburn, housed in an eighty-five year old home, offers a heritage experience combined with modern luxuries that few can match. Welcome Home. online booking is disabled. pls mail/contact us.